Diaphragm operated devices are essentially pistons operating within a cylinder. They transfer pressure from one sealed area to another. In the case of hydraulic and pneumatic cylinders, the moving piston is sealed off by a sealing device such as an o'ring, cup, vee packing, or a similar device. A diaphragm merely limits the stroke and provides a frictionless seal. Diaphragms generally cost less, have more tolerance range, and do not require hardened super finishes or lubrication. The function of a diaphragm is the most important factor in its design and manufacture. Simple diaphragms move from one position to another, such as pressure switches and solenoid valves. There are only two positions. In the case of modulating devices, such as regulators, the diaphragm must respond to small changes in differential pressure and the diaphragm must return to the same corresponding position. Here, the concern is with flexibility, uniform spring rate, and a minimum change in effective area. 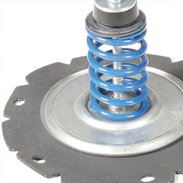 Diaphragms can also be used as shock absorbers as in a dash pot or as dampening devices in pulsating systems. In the latter the diaphragm reduces the high pressure spikes and smooths out the flow of fluid or gas to produce a more uniform flow. Diaphragms can also be used as barriers between fluids and gasses, such as in a pressure drop on the fluid side, the compressed gas expands against the diaphragm to maintain the fluid pressure. Diaphragms are also used in pumps, such as automobile fuel pumps, hand pumps, and diaphragm air compressors. In these cases an outside mechanical force is actuating the diaphragm. This functions to displace a volume of media. In the case of a pump the diaphragm creates a low pressure area causing the fluid or gas to move into this area. In all the above cases the function of the diaphragm will generally be the determining factor when considering the type of construction, the material composition, fabric design (weave/knit), and the type of polymer. Supported diaphragms are produced from a wide variety of fabric, varying strength, weights, and weaves. The fabrics themselves range from natural fibers, such as silk and cotton to the man-made fibers and high strength arimids. The elastomeric coatings can be put on both sides of the fabric in equal thickness or an unbalanced coating. Many applications require elastomeric coatings on only one side such as applications where the pressure differential is in one direction. When knit fabrics are employed, the coating is usually on one side and the same side as the pressure. This allows the fabric to support the coating on both sides for flat diaphragms. This construction suggests possibilities for obtaining a good deal more stroke with a flat diaphragm. The selection of the fabric substrate, in terms of strength, weight and flex life will greatly depend on the application. Fabric supported diaphragms have a distinct advantage over homogeneous diaphragms. Supported diaphragms have less tendency to stretch under pressure conditions. Because the rubber is continually under stress conditions it tends to degrade physical properties quicker. Most importantly, fabric substrate takes all of the stress from the rubber leaving the rubber to work in the least stress conditions.